Site improvements and program enhancements continue at the Burns Harbor Food Truck Square as the Town was awarded two grants. Camaraderie and community engagement has been the overall goal for the Town of Burns Harbor and the development of the Food Truck Square. The Town of Burns Harbor just became even greener. Porter County Recycling and Waste Reduction presented the Redevelopment Commission with two rain barrels as part of the Community Rain Barrel Demonstration Grant May 10. The Town of Burns Harbor Redevelopment Commission (RDC) continues progress towards economic and community growth, recently identifying several priority projects with strategizing and work towards completion beginning immediately. In the ever-changing, energized marketplace of coffee, two ideals remain constant for business owner Tandra Robinson. A playful gift for all children arrived early for the holidays as the Burns Harbor Park Department dedicated its newest playground equipment at a ribbon cutting Saturday morning. 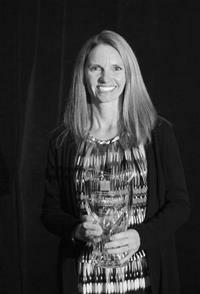 Burns Harbor Park Director Kim Burton received the 2016 Ivan H. Brinegar Municipal Management Award from the Indiana Association of Cities and Towns (IACT) for her creative leadership, passionate mentoring and humble service to the community. Marcus Rogala, Redevelopment Commission president, wasn’t feeling blue on Saturday night. The sounds of blues band Soulshyne could be heard coming from the Burns Harbor Food Truck Square, and Rogala was all smiles. 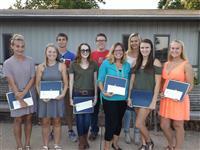 The Scholarship Board awarded nine residents with $1,500 scholarships at the August Council meeting. Attendees had plenty of options on the opening night of the Burns Harbor Food Truck Square this past Saturday, Aug. 6 with the first in a series of events featuring regional eateries for dinner and a movie. Burns Harbor may total just about 7 square miles with roughly 1,400 residents. But tucked inside this small, charming town stands a leading-edge company transporting more than 223 million pounds annually throughout the world. Nearly 400 attendees enjoyed the races, food, entertainment and other 1980s-themed fun of the third annual Footloose. Families looking for cost-effective, all-day summer fun for the kids are in luck with the Footloose event Saturday, June 25 at Lakeland Park in Burns Harbor. This year’s Footloose 5K on Saturday, June 25 at Lakeland Park in Burns Harbor boasts healthy outdoor activities, food, entertainment and other 1980s-themed fun for the whole family. 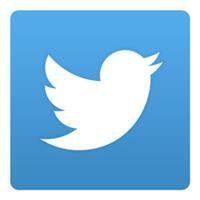 The Town of Burns Harbor launched an official Twitter account. Launched in early April, residents and friends of Burns Harbor may now Follow the Town on Twitter via the handle @BurnsHarborIN or directly at www.twitter.com/burnsharborin. Spring arrived early for the Town of Burns Harbor as the Park Department hosted another successful Easter Egg Hunt and first-ever Spectacular Egg Hunt for children with special needs. 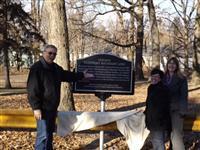 Work continues toward creating "tomorrow’s" Burns Harbor. The Town of Burns Harbor continued progress towards economic and community growth, favorably reinstating its development team to facilitate progress and identity of the town. On the night before Christmas Eve Santa Claus teamed up with the Burns Harbor Fire Department to spread some holiday cheer. Driving through northern Porter County on I-80/94 during the holiday season, passers-by have long grown accustomed to the tall lighted trees adorning the night sky in Burns Harbor. More than 150 kids of all ages celebrated the holidays at the 2nd Annual Santa Dash and visit from Santa event sponsored by the Burns Harbor Park Department on Saturday, December 12. Burns Harbor launched an official town Facebook page last month to improve communication with residents. The Burns Harbor Redevelopment Commission will host a public meeting with a special workshop for town candidates and employees this Thursday, Oct. 22 at 7 p.m. at Town Hall. The Indiana Association of Cities and Towns (IACT) announced the Town of Burns Harbor was named a 2015 IACT Community Achievement Award winner for its community visioning process in the less than 4,000 population category. Burns Harbor reorganized its leadership structure, focusing on the continuation of long-term development and evolution of the town’s identity. Burns Harbor Redevelopment Commission (RDC) President Greg Miller recently stepped down from the position. 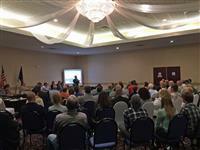 The Burns Harbor Redevelopment Commission (RDC) celebrated a large turnout and overall positive momentum towards future development of the town at a community update meeting held July 9. 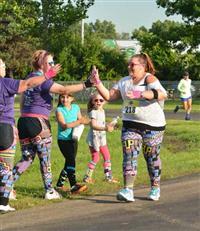 The Burns Harbor Park Department Footloose 5K celebrated a successful second annual event with more than 300 participants in attendance. Families, running enthusiasts and interested community members of all ages are invited to the second annual Footloose 5K Saturday, June 27 at Lakeland Park.